Today, the research is clear. Having good bacteria in your gut is critical if you want to feel your best, live your fullest, and maintain a disease-free quality of life. These days, there are hundreds of probiotics on the market to choose from. And yet, researchers know what your gut needs based on the ancient wisdom of your ancestors. Hundreds of years ago, your descendants were hunters and gatherers. They ate wild fruits and vegetables without washing. The natural soil and "bugs" on these foods were ingested, and these diverse bacteria made their way to the human gut. Now, modern Western diets are missing this very thing -- hardy, robust bacteria that come from the earth and prevent the gut and the body from growing weak. 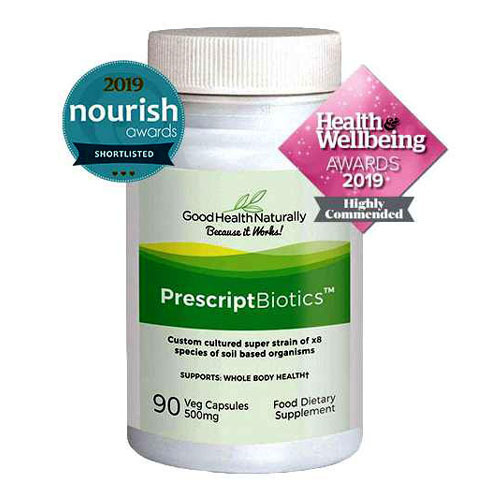 Prescript Probiotics' Bio-Identical SBO Probiotics Consortia is a group of natural, friendly microorganisms that help to renew the gut and create a healthy balance between the good guys and bad guys among your gut bacteria. Bio-Identical SBO Probiotics Consortia means life-giving and identical; Prescript Probiotics' soil-based bacteria are nearly the same as the life-force bacteria naturally found in your gut. What happens when you take soil-based Prescript Probiotics every day? Your gut can't help but change. Depending on the current state of your health and your gut's unique needs, you may see a whole host of benefits after supplementing with Prescript Probiotics. You may digest easier, with less gas, bloating, and cramping after a meal, thus improving your nutritional absorption. Your immunity may get stronger, with less aches and pains come cold and flu season. Your wellbeing, outlook, and energy levels may improve, and this is only the beginning. Prescript Probiotics powerful, soil-based microflora offer benefits to change your gut in 22 different ways -- supporting your brain, your metabolism and weight, your mood and energy, your body's internal communication systems, and much more. The soil-based bacteria found in Prescript Biotics have been called a biological miracle. These SBOs are an organic food source and are meant to be ingested every day. Like the soil brings you food to eat, Prescript Biotics' soil-based organisms give your gut life, just as Nature intended. There are over 100 trillion bacteria of 400 different species that can be found in the human gut -- your digestive tract. Your body relies on these healthy "bugs" to digest your food, absorb your nutrients, and produce the B vitamins and enzymes needed to ensure your daily health. But every day, this delicate balance of good bacteria in the gut is at risk: poor diet, lack of fibre, excess alcohol, smoking, antibiotic use, little exercise and sleep, stress, and even environmental toxins can burden the gut. Every day, you need the help of a powerful probiotic to keep your gut bacteria in balance, regulate digestion, and ward off disease.